I've mentioned a couple of places now that I'm working on "another project." 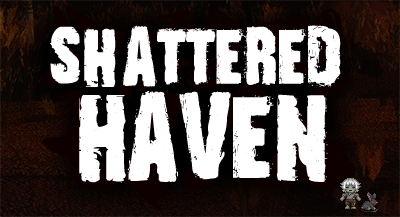 Shattered Haven is that project. This project is already extremely far along, because savvy Arcen lore-fiends will recognize that this is a revival of my old Alden Ridge project under a new name and with a ton of revisions (including 100% new art from the ground up thanks to Heavy Cat studios). It's been a project that has been on hold since 2008, before I even started working on AI War or thought about founding Arcen. I'm extremely excited to be able to finally come back to it and to finish it with all that we at Arcen have learned since I was last working on it. For now that's all I'll say about it, but now I can at least refer to it by name. We should have many more details for you within about a month, and we're currently hoping to have it to the preorder/beta phase by mid September. Now you know what I'm working on, at any rate! UPDATE: The forum thread for this post has been steadily prying more information out of me, starting here, if you're interested. Thumbs up ! Can't wait for more ! Be sure not to forget to Tweet about it !